The Cabo San Lucas Marine Preserve, just a short boat ride from Cabo San Lucas Marina, offers a spectacular snorkeling experience at an amazing dive site. This extensive preserve encompasses a remarkably dramatic rocky peninsula and the vibrant cerulean waters that surround this geological marvel. This peninsula is home to Lover's Beach, a gorgeous stretch of sand that faces the Pacific. This beach is ideal for lounging and sunbathing and offers easy access to the excellent snorkeling locales just offshore. This area is also home to the Sea Lion Colony. You can't help but crack a smile when you see these surprisingly large marine mammals sunning on the rocks and frolicking in the surf. 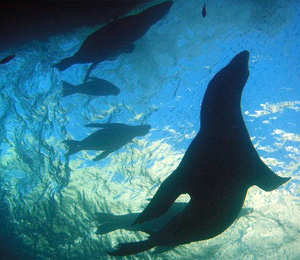 The Sea Lion Colony is a must-see attraction while vacationing in Cabo. You don't want to miss the iconic symbol of Los Cabos' unique rocky coastline - the Arch. This naturally-formed structure is probably the most photographed sight around Cabo San Lucas - so don't forget your camera. You'll also have a chance to snorkel next to the massive rocky outcroppings at Land's End. Pelican's Rock and Pirate's Cave are also popular attractions in the Cabo Marine Preserve. Perhaps the best part of this tour is the short travel time out to this premiere dive spot. Whether you have a full vacation schedule or are on a short cruise ship stopover - this two hour snorkel adventure will fit into your plans while allowing you to enjoy some of the best snorkeling locations around the region. An astounding array of marine species inhabit the reserve, including octopi, sea urchins, rays, lobsters, various crabs, sea turtles, parrot fish, clown fish, puffer fish, reef sharks, tube corals, fan corals, and many more. I have been to the Bahamas many times, but Marine Preserve Snorkel Adventure is one of my favorite trips! It includes everything that everyone should do here. As a Bahamas veteran, I can say only the best about this experience!